At this time ELP, K, and 1st grade are full for the 2019-2020 school year, please contact the school office at 636-441-7424 or email jkainady@zionharvester.org to be added to waitlist. 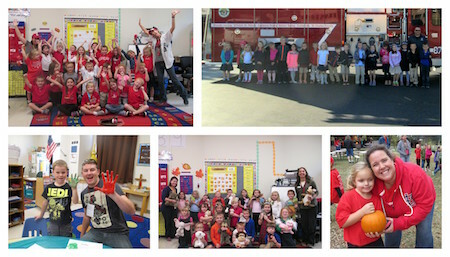 Kindergarten at Zion Lutheran School is a time of change, challenge and opportunity! Our five and six- year old’s make great intellectual and spiritual leaps throughout the school year. Areas of personal growth includes personal responsibility, self-direction and logical thinking. Our kindergarten experience shapes a child’s faith foundation and outlook on lifelong learning. The following paragraphs describe the expansive curricular experiences in our kindergarten classrooms. Zion offers half or whole day kindergarten with the opportunity for before or after school care. Our half day kindergarten meets 8am – 11:30am and our full day kindergarten meets 8am – 3pm. Kindergarten through Third Grade adopted Fountas & Pinnell Classroom™ (FPC) in the Fall of 2018. F&P, as we call it, is a multi-text approach to literacy instruction. The system is designed to support whole-group, small-group and independent learning opportunities through the following strategies: interactive read-alouds, reading mini-lessons, shared reading, phonics/spelling/word study lessons, and guided reading. The F&P Classroom experience gives our students the blueprint for learning that creates an authentic experience in reading, thinking, talking and writing. All new concepts are developed through hands-on activities and rich mathematical conversations that actively engage students in the learning process. Concepts are developed, reviewed and practiced over time; ensuring students retain all concepts and make important connections between mathematical understandings. Lessons are linked to everyday experiences, which makes learning more meaningful for the student. The following link provides a glance at our yearly mathematical scope and sequence for the kindergarten year. One in Christ curricular experiences help students learn of God’s Word through practical, engaging lessons. The spiritual understandings gained from the lessons are integrated into all curricular areas and extend into the playground, the home and the neighborhood, and ultimately around the world. Curriculum goals include: know our one true God (Bible literacy); grow in personal faith (discipleship); live in joy and contentment; express their faith and hope in eternal life in Christ Jesus. Click on the link to find our curriculum scope and sequence. Zion kindergarten students develop the important skills they need to print words and sentences through Zaner-Bloser’s step-by-step process for learning legible handwriting – a vital literacy skill. Developmentally appropriate activities increase legibility through regular self-evaluation. Fluency and automaticity are our end-goals.. The goal of the Second Steps program is to increase students’ success and decrease problem behaviors by promoting social-emotional competence and self-regulation skills. Specific program goals include: listening and paying attention; managing personal behavior and emotions; solving problems; and getting along better with others. These skills are essential for success in school, in the workplace and in life. The following link provides a look at our Second Step scope and sequence. Extending Kindergarten learning opportunities include: Physical Education; Music; Library; Field Trips, Weekly Chapel; Parent & Kindergarten projects; and special celebrations for Thanksgiving, Christmas, Mom’s Day, Dad’s Day, and Grandparents’ Day. We look forward to your phone call, email or visit!